Save 1% on the Rug Pad Central 3/8'' (32 oz Felt), 6'x9', Natural Comfort, Area Rug Pad by Rug Pad Central at Aulainter Americana. MPN: P32A. Hurry! Limited time offer. Offer valid only while supplies last. Our Natural Comfort felt rug pads are made from 100% recycled unused carpet fibers and yarn. Moth, mold, and mildew resistant. No added chemicals. Our Natural Comfort felt rug pads are made from 100% recycled unused carpet fibers and yarn. Moth, mold, and mildew resistant. No added chemicals. Our rug padding is safe for your home, MBDC Cradle-to-Cardle, LEED, and CRI Green Lable Plus for GREEN air quality. Our premium area rug pads are low VOC. 32 oz. felt heat pressed and needle punched into approximately 3/8" thick felt pad to provide a plush comfortable feeling underfoot as well as protect your floor. Made in the USA and 100% safe on any flooring surface. Perfect for all premium area rugs. Can be trimmed with a pair of household scissors. 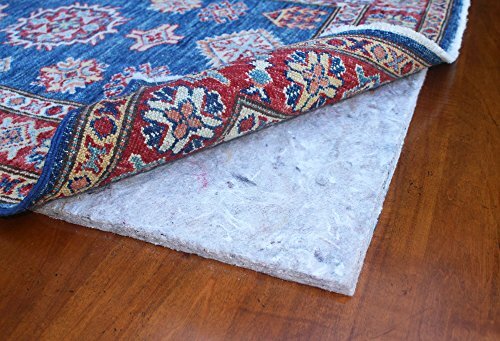 Solid style all felt pad providing the maximum protection by catching dirt and debris falling through the rug. Natural Comfort padding made of new recycled carpet fibers mainly nylon and polyester. Low VOC pad safe for the home. Dense 3/8" thick felt protects rug from wear against hard flooring surface as well as really adding cushion to the feel of your rug. Supportive felt layer absorbs impact from walking atop rug to assist in quieting foot noise. This rug pad is 100% felt and will not stop your rug from slipping. Not recommended for smaller rugs with a tendency to slip. If you have any questions about this product by Rug Pad Central, contact us by completing and submitting the form below. If you are looking for a specif part number, please include it with your message.